I have been adding a post every day this month. This is the last one. And it’s a favourite. I love Black Forest Gateau. I really don’t understand how anyone could not. Well, anyone who loves chocolate and cherries that is. The month has been marked for me by just a bunch of bad luck. Everything breaking. Losing things. Not being able to find the ingredients I want. Which was actually particularly annoying. I couldn’t even find any fresh cherries in the supermarkets. Don’t they usually have cherries in the shops this time of year? Or is that usually closer to the holidays? Although I have to admit there have been some positives to everything going wrong. I was without a car so although I have been really stuffing my face this month I’ve lost a little weight. Like a pound. Maybe. – OK, maybe eating loads is not that big a change for me. But cycling everywhere isn’t something I’ve done since 2012 or 13 I think. And I should because it really makes you feel better to cycle more. Even though conditions have not improved for cyclists out there – there are no proper cycle lanes in this city really. And cycling everywhere is exhausting. I didn’t think I was that unfit. – Maybe it’s good to have learned that also. By the way if you are from Dublin reading this thinking – yeah, there are cycle lanes. Well, would you call a footpath that ends abruptly, and that cars and buses can just drive on to when ever they feel the need to a footpath? Didn’t think so. The other good side of things was not being able to find exactly what I wanted. Sometimes I made do with stuff I had in the cupboard – which led to the ever-so-yummy Baked Coconut Rice Pudding. Sometimes I just bought a bunch of stuff because I had no clue what to do when I couldn’t find what I wanted – which led to the divine Fruit Salad Cake. And sometimes it was a bit of both – which is what happened with Vegetarian Split Pea Soup with Apple and Smoked Cheese. I sound so self-congratulatory – and I am about this in fairness. Most of the recipes I added this month were dishes I’ve made before and really like. But the experiments turned out well. And in particular I love love love the three above. Blogging everyday is not something I’m going to continue. I did it to pull myself out of a little funk. I’m not sure how well it’s worked on that – but I am really glad I did it. Fail to prepare? Prepare to fail. Better power on through! 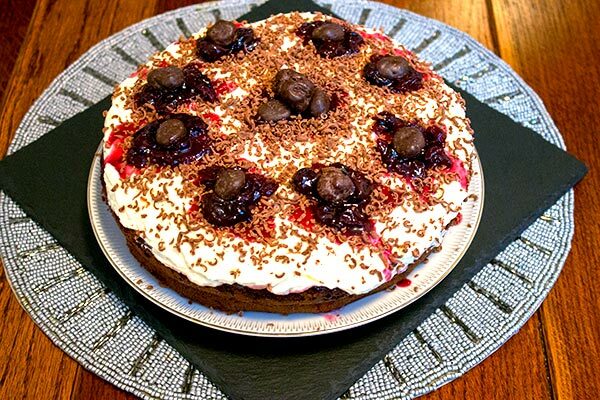 I love this Black Forest Gateau recipe. That’s all I’m going to say about it. Hope you do too! Double cream, cherries in kirsch syrup, Morello cherry jam, cocoa, caster sugar, plain chocolate and eggs. 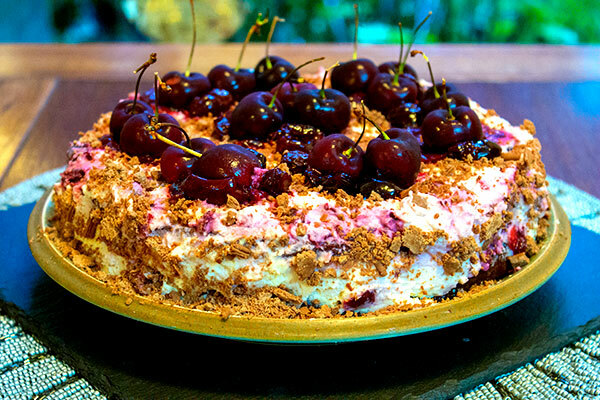 And there should be fresh cherries to put on top – but I couldn’t find any so I put chocolate covered cherries on top instead. Turn the oven on to 180 C. Grease two 9 inch/ 23 cm cake tin and line the bottom with baking paper. Grease the baking paper also. Separate the eggs into two large bowls. Beat the egg whites until they form soft peaks. Beat 175g of caster sugar into the egg yolks until they turn pale. Fold in a couple of tablespoons of the egg white into the yolks. Then fold in the sieved cocoa powder. Mix in the vanilla extract. Fold in the rest of the egg white until you have a perfectly combined mix. Pour half of the mix into each cake tin and bake for 15 minutes or until just set. Take out of the oven and allow to cool in their tins. When they have cooled but are still a little warm turn out onto plates. With a strainer over a bowl, pour the jar of cherries in kirsch into the strainer. Put the drained cherries in the strainer into another bowl. Mix the jam into these cherries. Spoon some of the kirsch into the jam and mix around. Poke the bottom layer of the cake with a fork and spoon over some of the kirsch. Spread about half the jam mix over this layer. Pour the cream into a large bowl. Add a generous tablespoon of caster sugar and beat until it forms very soft peaks and is spreadable. Spread half the cream over the jam-covered base layer. Place the second layer on top. Poke it with a fork and spoon some of the kirsch on top. Spoon over the rest of the jam - save for a couple of spoonfuls. Spread the rest of the cream over this. Grate some milk chocolate over the cream - or crumble a flake over it. Add dots of the cherry jam around the cake and at its centre. Top these dots with fresh cherries - or glacé cherries - or chocolate covered cherries - whichever you prefer. Leave in the fridge until ready to serve. Enjoy! After baking for 15 minutes take out and let cool in the pans. Separate the cherries from the kirsch. Mix in the pot of jam with the cherries as well as a few spoons of the kirsch syrup. Spoon about half the cherry jam on to the base layer of cake, then spread over a thick layer of the sweetened double cream. So I decided to add a good bit of the syrup over the top layer. Just be sure to leave a bit of the jam for the very top. Black Forest Gateau. Assemble and put in the fridge until ready to serve. And one with fresh cherries.